Darth Vader (David Prowse) and a defiant Princess Leia (Carrie Fisher) in Star Wars (1977). Arguably the most recognizable supervillain in the world, Darth Vader is the creation of film writer/director George Lucas for his sextet of Star Wars films. And although Dracula and other monsters may lay claim to centuries of storylines, no single villainous visage has been merchandised as much as Vader's black bell-shaped helmet. Introduced in the film Star Wars (1977), Darth Vader was first seen striding through the smokefilled, battle-scarred hallways of a Rebel transport, his audible breath chilling, his deep voice commanding, and his prodigious strength evident as he lifted a Rebel soldier and crushed his neck with one hand. 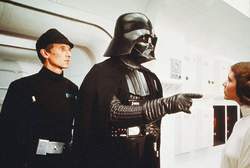 Viewers soon learned that Vader was a Dark Lord of the Sith, and the companion to the Galactic Empire's Grand Moff Tarkin, who was planning to use a battle station known as the Death Star to wipe out the Rebel Alliance. Vader captured and tortured Princess Leia Organa and killed Obi- Wan Kenobi, the last of the Jedi Knights and his one-time teacher and friend. As the film ended, Vader's TIE Fighter was struck by lasers and he spun off into space. Though he continued to appear in novels, comic books, and newspaper comic strips, the “live” Darth Vader next appeared in the film The Empire Strikes Back (1980), in which it was revealed that he was second-in-command to the evil Emperor Palpatine … and that he had not killed Luke Skywalker's father (as Obi-Wan had told Luke); he was Luke's father! In the third film of the trilogy, Return of the Jedi (1983), Luke found out that Leia Organa is his twin sister, and the daughter of Vader. After a lightsaber battle aboard the second Death Star between Luke and Vader, the Sith Lord betrayed the Emperor. Wounded, Vader asked Luke to remove his mask so he might look upon him as his father, Anakin Skywalker, before he died. Anakin's spirit became one with the light side of the Force, and Luke burned his armor. In the late 1990s, George Lucas began work on a trilogy of Star Wars prequels: Episode I: The Phantom Menace (1999), Episode II: Attack of the Clones (2002), and Episode III: Revenge of the Sith (2005). Set a few decades before Star Wars (now known as Episode IV: A New Hope), the films first showed nineyear- old Anakin Skywalker—perhaps the result of an immaculate conception—as a slave on the desert planet Tatooine. When Jedi Knights Qui-Gon Jinn and Obi-Wan Kenobi discovered that Anakin had immense powers in the usage of the mystical Force that binds the galaxy together, they took the youngster on as a Padawan apprentice. As Anakin grew, his powers became ever stronger, and the Jedi Council realized that although he might be the prophesized Chosen One who would bring balance to the Force, he also seemed to have a dangerous side to him. Unfortunately, even as he fought the Clone Wars beside the other Jedi Knights, elements conspired to turn Anakin to the Dark Side of the Force. His mother, Shmi, was killed, and he slaughtered an encampment of Tusken Raiders in revenge. Forbidden to love, Anakin nevertheless embarked on a romance and eventual secret marriage to Senator Padmé Amidala from Naboo. Most worryingly, Anakin was befriended and seduced by Senate Chancellor Palpatine, an ambitious man who—unbeknownst to the Jedi Council—was really the Sith Lord Darth Sidious. Palpatine slowly twisted Anakin to evil, resulting in the young Jedi helping to slaughter members of the Jedi Council and their young initiates. Anakin faced his mentor in a lightsaber battle on Mustafar, but he fell prey to the superior training of Obi-Wan Kenobi and was badly burned by the molten lava of the planet. Rescued by droids sent by Palpatine, Anakin was reconstructed using cybernetic parts and a suit and helmet that allowed him to breathe and heal. Utterly consumed by the Dark Side of the Force, Anakin was now Darth Vader. He wouldn't find out until decades later that Amidala had died in childbirth, and that Luke and Leia were his children. In the original Star Wars trilogy, Vader was played in the costume by British bodybuilder David Prowse, but his basso voice was provided by James Earl Jones. For the later trilogy, Jake Lloyd played a young Anakin, while Hayden Christensen played the teen Anakin. In one of his many bits of tinkering with his beloved film projects, Lucas digitally inserted Christensen as the ghost of Anakin at the end of the Return of the Jedi DVD, though the scene in which Vader is unmasked at his death features actor Sebastian Shaw. Darth Vader's initial design was by concept artist Ralph McQuarrie, who gave Vader the facemask as a breathing apparatus to cross between ships in the opening scene of Star Wars. Lucas had asked McQuarrie to give Vader a helmet like a medieval samurai and a fluttering cape. Sound designer Ben Burtt created Vader's breathing after many attempts to synthesize eighteen types of human breathing; his solution was to use the sound from a scuba regulator. One element many fans miss is that Vader's breathing is constant, like an iron lung, and is not in tempo with his speaking. Vader has had many stories told about his life in the novels and comic books spun off from the Star Wars licensing realm—known as the “Expanded Universe” stories— but it was in toy and collectibles licensing that Vader's stories continued in the hands of the fans themselves. Clad in padded black armor and an inky cape and cloak, the two-meter-tall Darth Vader appeared as action figures, puppets, candy dispensers, posters, school supplies, food, clothing, cake pans, costumes, life-size statues, and literally thousands of other items. Lucasfilm licensed the character to appear at autograph tours and Hollywood award functions, and the villain shilled in commercials for soft drinks, candy, and cellular phones. Although the Star Wars films have finished production, Lucas announced in 2005 that more Star Wars material, including a television series, is in the works for the future. Set in the time period between the trilogies, it seems likely that fans have not seen the last of Darth Vader, nor heard the last of his thrumming red lightsaber or his tortured breathing. TROOPING INR2-D2, Darth Vader, Jawa and Stormtroopers chat to a patient. The party turned Lenin, the symbol of communism, into Darth Vader, which was one of the most famous characters in Star Wars movies written by George Lucas. Among the newest items in the line, available in R2-D2, C-3PO, Darth Vader and Storm-trooper varieties, are a 10-inch plate selling for a suggested $4. Summary: In the 1987 sci-fi spoof Spaceballs, Rick Moranis' Darth Vader parody announces, "Evil will always triumph, because good is dumb. They approached us saying they wanted a Darth Vader helmet-shaped island. Darth Vader island among requests on Dubai's 'The World' islands..
TWO OF THE STAR WARS GALAXY'S MOST FAMOUS CHARACTERS--the Sith Lord Darth Vader and beloved Yoda--top the latest Talkers from CandyRific. To understand this strategy one could imagine harmful bacteria being like Darth Vader, and the anti-virulence drug would take away his armour and lightsaber," explained Dr.
Star Wars baddie Darth Vader paid a visit to the town's Kings toy shop - and it proved to be a crowd puller to say the very least. And even the wedding was attended by Darth Vader and two Imperial Stormtroopers.